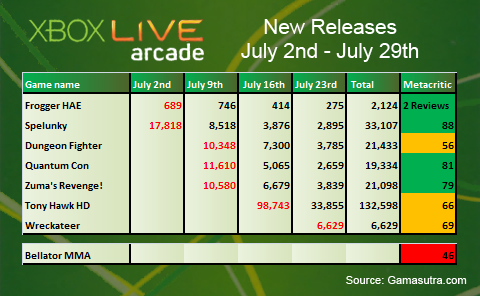 Gamasutra have published their monthly Xbox Live Arcade sales analysis for August. 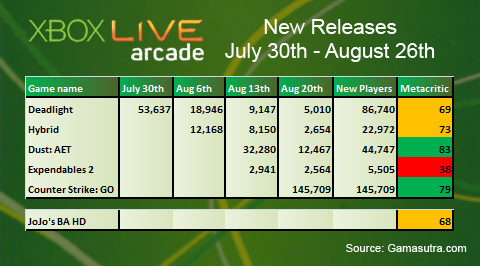 This month we find out how well the second half of this year’s Summer of Arcade games performed, and so far the promotion is looking to be the weakest yet. Deadlight was the third game released during the annual promotion seeing around 86.5K downloads to date. It wasn’t a game we liked, but it did demo well. This puts Deadlight in second place after Tony Hawk’s Pro Skater HD which has now sold around 182K. Hybrid on the other hand has only managed 22K downloads. Whilst we enjoyed it, this is perhaps not totally surprising given the game’s unusual gameplay and difficult day one, and don’t get us started on the Metagame! The final game in the promotion was Dust: An Elysian Tail. The action RPG was highly rated all round and gained a respectable 44.5K downloads in its first two weeks. Which leaves Wreckateer as the worst performing game in the promotion, and also, according to Gamasutra, throughout the history of Summer of Arcade, with just less that 15K downloads to date, which is a shame as it was a game we enjoyed. 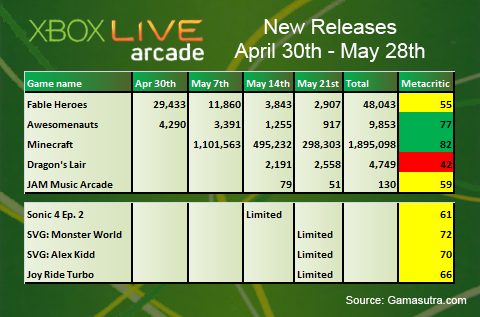 As expected, of the other games released this month, Counter-Strike: Global Offensive sold well and The Expendables 2 didn’t. Jojo’s Bizarre Adventure HD Ver also released during August, and at a bizarre 1600 MSP price point to boot, but unfortunately did not have any single player leaderboards that Gamasutra could follow. For quick look at what games are due out next month, take a peek at our new Calendar Update feature.